analog mixer, DaviSound decided to go ahead and introduce its new "DaviSumThing" mixer as the first order of business for 2005! This "WG" 2U rack mount "Tool Box" offers six mono input channels (1-6) with pan-pots for panoramic routing. It also provides two true STEREO inputs (channels 7 and 8) for those using stereo keyboards or other line level stereo program sources. MP-1 universal amplifier MasterPiece modules for ultimate signal integrity and fully active variable gain master controls! Up to 14 dB of overall gain is provided from inputs to main outputs with master controls functioning as active gain trim controls as well as group Master faders. A stereo headphone jack is provided for reference monitoring and an associated phones on/off toggle allows you to route the output signals simultaneously to the headphone jack when desired. The T-R-S 1/4" front jack could also be used as an unbalanced main stereo front panel jack feed if desired. DS in/out toggle switch. The DaviSirkit offers PASSIVE R/C networks comprised of audiophile grade resistors and capacitors which provides a gentle 7dB shelving boost at low and high ends, somewhat similar to that associated with traditional Fletcher-Munson "Loudness" EQ. It is, however a slightly different curve and boost ratio and, different peaking frequencies, those which have been shown to be the most "musically prefered" by professional recordists for most program sources. It can be used, or not used, at the option of the operator and, when switched out, it is TOTALLY by-passed for no affect on the signal whatever. Main power switching from the on-board, toroid-powered DaviSupply, which provides the power for the maximum headroom performance (+32 dBU), is provided with a third front panel mini-toggle and associated Blue LED power-on indicator. Input and output connectors are XLR and the unit is specially designed to accommodate both balanced sources and loads as well as unbalanced! Bridging input impedance is about 10K Ohms and output impedance is 100 ohms. Now you can mix and combine your preamp signals, or recorded tracks, with full ANALOG integrity without worry of digital software/hardware mixing "artifacts" whatsoever! The TB-11 is packaged in 2RU-"WG". we decided to go ahead and introduce an all new Tool Box geared especially toward the smaller project studios and the home recording musician. Now these users, who record exclusively with just one or two channels at a time while tracking, can have the precision of the TB-6 in a two channel package at reduced cost, without paying for the extra channels they do not need. The TB-12 is, functionally, essentially a TB-10 without the VU meter feature! As such it is packaged in the smaller 2RU cabinet. Another important cost reducing distinction, from the TB-10, however, is the utilization of the same two MIC-ALL MP-2 modules as either the microphone amplifier or the instrument amplifier for each respective channel with the flick of a front panel mini toggle switch. This switch can select either the microphone input jack or, alternately, select the instrument jack while simultaneously adding instrument matching buffer circuitry to the front-end of the MP-2! Allowing each channel's MP-2 module to do double duty in this fashion saves the expense of the separate amplifier blocks packaged with the TB-10. Yet, the unique multi-switching arrangement still provides a balanced, differential instrument amp for the instrument input jack, which is a T-R-S 1/4" panel jack ... utilizing the same amplifier block as the channel's mic input! Here is your TB-12 ... the ultimate in dual preamp packaging efficiency, at the lowest possible price, that we can offer for a preamplifier in our "WG" Tool Box hand-crafted format! Although this unit still requires much of the same preparation time, including the custom "WG" cabinet preparation of it's "busier" brothers, this new entry will also save some steps, thus some time, in fabrication. This will, thereby, make it our fastest "turnaround-time" Tool Box offering to date ... even if only by a small margin. The electrical specs of this unit, are of course, the same as the TB-6, and the functionallity very similar to the TB-10, described above. The TB-12 is a two channel, "either/or" (mic/instrument) unit whereas the TB-10 offers four discreet channels. Each of the two channels of the TB-12 include a front panel XLR mic jack, a front panel T-R-S instrument jack, a horizontally operated mini toggle phase select switch, a horizontally operated mini toggle mic-instrument select switch, and a vertically operated phantom power on/off switch with an associated green LED indicator. And, of course, the channel gain control is also provided in the control cluster. The TB-12 is available in 2RU-"WG". The new TB-12 is being offered in "WG" 2RU format only. For those who have never before seen or heard about the unique packaging of the DaviSound all wooden "WG" models, some of the above photos might have aroused quite a bit of curiosity. 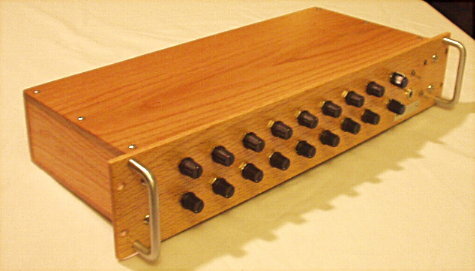 The following section briefly describes how the unique, all wooden rack mount packaging has evolved to its current state and simultaneously become quite a distinctive "benchmark" for DaviSound. "WOOD YOU LIKE TO HEAR!" In the early days, our standard rack mount designs were traditionally fabricated using a unique combination of aluminum control panels, rear panels and top and bottom covers with real, solid, half-inch American Red Oak for the side panels only. The normal color scheme in those days was baked almond for the front and rear panels, flat black for the top and bottom panels and natural, hand-rubbed oil finish for the oak side panels. was HIDDEN INSIDE the rack cabinet! Taking a cue from all of these favorable comments regarding the real "wood-look" of our oak cabinet side rails, we next began using 1/4" Oak top covers and bottoms for our rack cabinets thereby forming the entire interior, main cabinet from polished wood. Soon, we learned that some users preferred leaving their units table mounted, outside the rack, so as to enjoy and display the aesthetics of the hand-rubbed wooden cabinetery. So, we then began offering optional rubber cabinet feet by request! We figured, why not go a little further and offer the FRONT and REAR PANELS in solid wood, where applicable, also! REAL "WOODGRAIN" ("WG") RACK CABINETS MADE ENTIRELY OF WOOD! The front control panels of the WG units, as well as the rear connector panels, are made of the same solid, 1/4 inch wood that we use for our cabinet structures. as well as inside the rack! (the ONE time we let a magazine review one of these pieces they erroneously refered to it as "beautiful veneer"- quite a mistaken degradation!). While we still offer an option of a metal faceplate control panel for some models, as of 2005, "WG" styling became the norm ... the new "standard" for DaviSound "Tool Boxes". This DaviSound originated concept offers a truly unique approach to modern audio cabintery with special "aesthetic appeal" for any equipment rack, or table mount, application! Also, please note that where necessary for shielding purposes, wooden panels and cabinet coverings interiors are copper ground-plane shielded ... and inter-connected with copper braid ground strap. Normally, unless you specify the metal option, then the all wooden cabinet housings will be the norm. Since the rear connector panel is also made from 1/4" thick Oak (or other woods) this offers, amongst other things, excellent electrical isolation and immunity to ground loops. The "WG" designation means that the front panel (control panel), as well as the rest of the cabinet, will be fabricated, in entirety, from solid wood. American Red Oak is the standard but other exotic woods are available as an option according to availability or special order. Like all natural things, every piece of wood has its own, distinct character and "personality". This makes EACH AND EVERY "WG" model unique unto itself which enhances the aesthetic value of the piece as well as the actual appreciative, collectible and keepsake value! Keep in mind that as part of this wood "character" it is impossible to find/utilize a "PERFECT" piece of wood. This means there may be slight imperfections, or variations, in terms of grain pattern, color uniformity, and skew. However, any such natural variations in our selected pieces are very minor and are the very things that gives wood its charm and "character" appeal for musical instruments down through the ages! Our cabinets are "hand rubbed" with penetrating oil finish for a "rustic elegance" that allows the wood character to "speak for itself". We do NOT, typically, use heavy, layered acrylic coatings or polished, "mirror finishes" preferring, instead, the more natural wood-look with protective, soft luster, "satin" finish. as individually unique as your own fingerprints! As mentioned, for those who would prefer a painted aluminium faceplate, these are available by special order for most models. While custom paint colors are available to some extent, best results are typically acheived with baked-on almond or black enamels. In late 2005 and early 2006, we also introduced a very unique paint style for aluminum faceplates called ... "DaviStone" . You might want to click the link and check this most unique, variation! 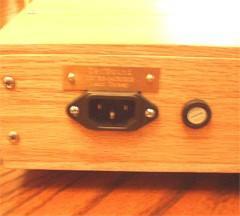 Aluminum faceplate models are still fabricated with "WG" all wooden interior cabinetry, typically of Oak or Poplar. Of course, for those of you who would prefer NOT to take advantage of any of these unique wooden cabinet variations for whatever reason, we will always offer all-metal cabinets as a custom option, for most models, priced by quote. Please also note that we do NOT recommend using the "WG" option for heavy duty road use! In these instances, it is suggested that you request the all-metal cabinet option. Our handcrafted, sculptured wooden cabinets are designed for permanent mounting in a studio environment and, after obtaining, unwrapping and viewing his/her very own unit, we cannot imagine anyone wanting to subject such one-of-a-kind craftsmanship to the perils of the road! The same all metal recommendation is true if a particular unit is to be used in close proximity to a high power RF field such as a broadcast transmitter location. Keep in mind that since all metal cabinets are no longer the norm for us, pricing for this option will be on an individual quotation basis, where requested, depending upon the particular model. WHAT YOU HEAR through your monitors! All TOOL BOXES feature active, transformerless balanced inputs and balanced/unbalanced outputs by design. Therefore, Tool Boxes can be interfaced with any other type of equipment. The following segment on "Ins & Outs"
DaviSound Tool Boxes, unless otherwise specified, use XLR connectors for inputs and outputs. Mic input impedance will be 2 KOHMS, internal, differentially balanced for ideal interface/voltage transfer with any professional low impedance mic from 50 ohms impedance to 600 ohms impedance. On Phantom powered versions, V+ DC will be divided and supplied equally via .1% metal film resistors to pins 2 & 3 to maintain circuit balance. Line Inputs will be of medium high bridging impedance (10 Kohms to 47 Kohms depending on the unit) designed to provide non-loading interface with today's low impedance drive amplifiers. If your drive source employs a transformer in the balanced output stage, you will need to be certain that it is properly matched with terminating resistor of the proper value (usually 600 Ohms) as transformers need to "see" a load of their rated output impedance whereas modern differential voltage amplifiers are happier driving higher impedance bridging loads. Line Outputs will be 100 ohms, typically "quasi" balanced ("impedance balanced"), or differential, active balanced, for driving virtually any succeeding input stage. While rated for 600 ohm loads or higher, "MasterPiece" circuit modules can typically drive loads as low as 50 ohms (or lower!) and still maintain complete signal integrity and linearity ! Since most units feature a fully descriptive, on-line manual, linked from each basic description above, this section now covers just a few basics which are common to all Tool Boxes. All units come with AC power supplies internal and feature IEC receptacles with EMI filtering and supplied, detachable power cords. You will learn more about our power supply design in the description of our outboard power supplies below. dated and signed by Hayne Davis. Rack mount screws and shoulder washers are also provided and rubber feet will be included if requested. with set-screw mounted , black, phenolic knobs with white indicator. Each unit features convenient rack handles for easy handling and mounting. Some models use hard phenolic plastic and others use metal handles. Whereas ... special ordered models with painted alumminum faceplates normally utilize the black plastic rack handles. Tool Boxes employ a, typically 1 amp ( 1 AG ), fuse in line with the power transformer primary, accessed on the rear panel fuse holder. The detachable line cord connects to the built-in IEC connector/AC EMI line filter. TYPICALLY AT NO EXTRA CHARGE! As of 2006, the interior cabinetry of most Tool Boxes has been reduced with diminished depth, by popular request. Interior cabinet top to bottom will be about 1/4" below the front panel edges of each respective rack size .